What Are Shapes and Images? The shapes are objects which represent a visual illustration which can be inserted in a worksheet. In the document model they are represented by the abstract class FloatingShapeBase. The image is a kind of shape which is characterized by having an image source. They are represented by the FloatingImage class, which inherits FloatingShapeBase. CellIndex: The cell index where the top left corner of the shape is located when the shape is not rotated. OffsetX: The offset between the left side of the shape and the left side of the cell index. OffsetY: The offset between the top of the shape and the top of the cell index. Width: The width of the shape. Height: The height of the shape. RotationAngle: The angle (in degrees) by which the shape is rotated about its center. IsHorizontallyFlipped: Indicates whether the shape has been flipped across the y-axis. 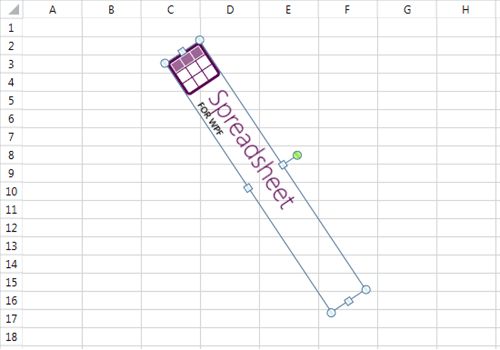 IsVerticallyFlipped: Indicates whether the shape has been flipped across the x-axis. Name: The name of the shape. LockAspectRatio: Determines whether the aspect ratio between the width and the height of the image will be preserved. Id: A unique number assigned to the image after it has been added to a worksheet. Worksheet: The worksheet in which the shape is or will be inserted. ImageSource: Represents the source of the image. Create a FloatingImage instance as in Example 1. Configure its properties as in Example 2. 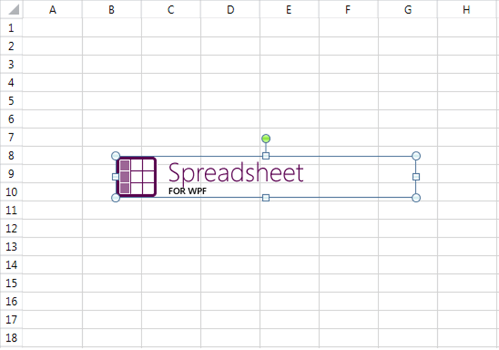 Insert the image into the worksheet as shown in Example 3. In order to create an instance of FloatingImage you need the worksheet in which you want to insert the image, the cell index and the offset. The next step is to configure the other properties of the image as needed. 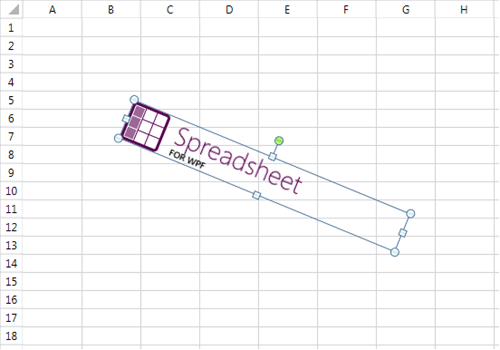 Insert the image into the collection of shapes of the worksheet. Note that the worksheet needs to be the same as the one passed in the FloatingImage constructor, otherwise an exception is thrown. In order to delete a shape from a worksheet, you need the shape's instance. The collection of shapes of the worksheet exposes a Remove() method with two overloads which you can use. Example 4 demonstrates how you can remove the image added in Example 3. The Width and Height properties do not take the LockAspectRatio property into account. If you would like more control on whether the aspect ratio of the shape should be observed, you can also use the following methods. These two methods will be further explained in the next section. The rotation angle of the shape can affect the CellIndexM property and the offset. The relationship between these properties is described in more detail in the next section of this article. The CellIndex of the shape and the cell index where the top left corner of the shape is visually located do not necessarily coincide when there is rotation applied. Consider the following image which has CellIndex B8. If we increase the rotation angle of the image, it will be visualized differently. It appears that the top left cell index is B5, however, the CellIndex property of the image will remain unchanged, B8, as will the offset. This set up is convenient as it allows more intuitive rotation of the shapes. However, when the rotation angle increases substantially, the underlying CellIndex of the shape might become too distant to be useful. In order to avoid this, once the rotation angle becomes 45° and more, the CellIndex should switch to where the top left corner would be at 90° rotation. At this point, the CellIndex property of the shape is D1 and the offset should also be recalculated accordingly. Another occasion when adjustments to the top left cell index and offset of a shape might be necessary is when the size of a rotated image is changed. Changing the top left position of the image might be necessary if it is desired that the visual top left corner of the shape remains unmoved. Additionally, if the size and the rotation angle of the image will result in a top left position outside of the worksheet, the position needs to be automatically adjusted to fit inside it.